Lobular carcinoma in situ was first described as a distinct entity by Foote and Stewart in 1941 1, although there is still considerable controversy concerning the true nature of the lesion and the most appropriate terminology. Haagensen and colleagues2 consider the lesion to be precancerous and call it simply ‘lobular neoplasia’, while Toker and Goldberg3 prefer the noncommittal term ‘in situ small cell lesion’. It is usually an incidental finding in biopsies performed for other reasons, such as cystic disease, since it does not itself produce a palpable mass and it cannot be recognized macroscopically. Although lobular carcinoma in situ is sometimes found in tissue removed because of mammographic calcification, it is rare for the calcium deposits actually to be within the tumour foci; they are usually situated in adjacent non-neoplastic tissue. Pure lobular carcinoma in situ accounts for about 2–3% of all mammary carcinomas. 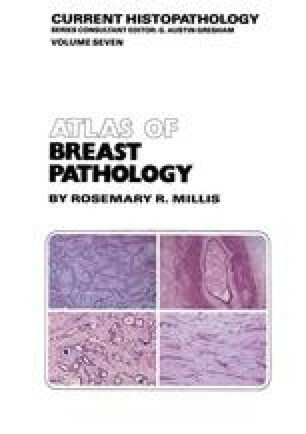 Discrepancies in the incidence reported in the literature may be attributable to geographical variations as well as to different diagnostic criteria and thoroughness of examination of breast biopsy tissue. Lobular carcinoma shows a high incidence of multicentricity and bilaterality. Multicentricity has been estimated to be at least 70% and bilaterality at least 30–35%4.